This is a scalable context timeline. It contains events related to the event 1996-2008: FBI Uses InfraGard to Train Private Citizens to Cooperate with Government, Potentially Enforce Martial Law. You can narrow or broaden the context of this timeline by adjusting the zoom level. The lower the scale, the more relevant the items on average will be, while the higher the scale, the less relevant the items, on average, will be. 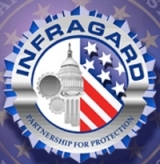 InfraGard logo. [Source: Progressive.org]Twenty-three thousand executives and employees of various private firms work with the FBI and the Department of Homeland Security. The group, called InfraGard, receives secret warnings of terrorist threats well in advance of public notification, and sometimes before elected officials. In return, InfraGard provides information to the government. InfraGard is a quiet quasi-governmental entity which wields an unknown, but extensive, amount of power and influence. Michael Hershman, the chairman of the advisory board of the InfraGard National Members Alliance (INMA) and the CEO of an international consulting firm, calls InfraGard “a child of the FBI.” The organization started in Cleveland in 1996, when business members cooperated with the FBI to investigate cyber-threats. The FBI then “cloned it,” according to Phyllis Schneck, chairman of the board of directors of the INMA. Schneck is one of the biggest proponents of InfraGard. As of February 2008, 86 chapters of InfraGard exist in each of the 50 states, operating under the supervision of local FBI agents. “We are the owners, operators, and experts of our critical infrastructure, from the CEO of a large company in agriculture or high finance to the guy who turns the valve at the water utility,” says Schneck. According to the InfraGard website, “At its most basic level, InfraGard is a partnership between the Federal Bureau of Investigation and the private sector. InfraGard chapters are geographically linked with FBI Field Office territories.” After the 9/11 attacks, InfraGard experiences explosive growth—from 1,700 members in November 2001 to 23,682 members in January 2008. 350 members of the Fortune 500 have members in InfraGard. Prospective members are sponsored by existing members, then vetted by the FBI. The organization accepts members from agriculture, banking and finance, and chemical industry, defense, energy, food, information and telecommunications, law enforcement, public health, and transportation industries.